Since the foundation in 1990, the Lawrence Wilson Art Gallery has presented an innovated program of exhibitions, featuring artwork from the University extensive Art Collection, loaned works as well as new contemporary commissioned works. The Gallery aims to continually expand its digital archive of past exhibitions. Memento Mori are artworks that prompt us to ponder the emptiness and transience of earthly pleasures and re-assess our moral progress as we move toward the certainty of death. The extraordinary video work Allegoria Sacra by the Russian collective AES+F is an evocation of Purgatory as an international airport and together with selected works from the University of Western Australia Art Collection and the Cruthers Collection of Women’s Art, it encourages viewers to contemplate their own mortality. Visit the archived Memento Mori exhibition website. Self Portrait as Shared Dream is a play on the Cruthers Collection of Women’s Art’s strong thematic focus on self-portraiture. Instead of attempting to express the ‘individuality’ of the subject, the exhibition presents a collection of works in which the individual is a collective construction, a figure forged from common histories, pop culture references and institutional memories. Linked by a dreamy, abstract wall-drawing by local artist Anna Dunnill, figurative paintings, prints and drawings explore disturbing, beautiful and surreal interactions between external and internal worlds. As the urge to define our individual selves reaches fever-pitch online, Self-Portrait as Shared Dream speculates on the nature of empathy and the collective experience. 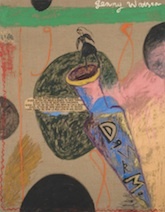 Featured artwork: Jenny Watson, Drink Me, 1988, oil and collage on linen, 137 x 106 cm, CCWA 594 Copyright courtesy the artist. Visit the archived exhibition website. In 1952, at the age of 17, Shirley Corunna (nee Bynder) a young Yamatji woman moved from her home in Three Springs to Perth. This exhibition celebrates Shirley's journey of discovery and independence and provides a snapshot of the social life of Aboriginal people living in the city during the 1950s. The Coolbaroo League was an organisation with political interests as well as being a place for Aboriginal people living in the city to come together and socialise. The memorabilia and photographs encapsulate treasured memories and a personal account of time Shirley spent with the League. WARNING: We advise that this exhibition contains images, sound and film of deceased Aboriginal and Torres Strait Islander people. Please view with caution. We apologise for any distress this may cause. Visit Wildflower Dreaming exhibition website. Pat Larter is better known as a muse for her husband, Australian pop artist Richard Larter, than for her own paintings and collages. 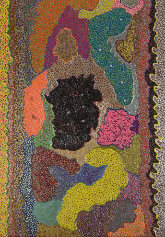 Lola Ryan’s shellwork harbour bridges, boxes and wall hangings, which continue an indigenous tradition particular to La Perouse near Sydney, were for many years considered part of a souvenir trade rather than an art history. Glitter presents these two under-recognised Australian practices in conversation. Sharing an unconventional approach to materials and a neon colour palette, Larter and Ryan’s works speak with unique voices and energy about kitsch, decoration, and the questionable distinctions between art and craft. Featured artwork: Pat Larter, Bumpty Bump, 1993, acrylic, decorative mirrors and glitters on board, 183 x 12cm © courtesy the artist’s estate. HERE&NOW14 presents an exciting exhibition of contemporary ceramic work from both emerging and established Western Australian artists. The exhibition encompasses a variety of materials and techniques ranging from fine porcelain forms and rustic stoneware installations to large-scale sculptural work. Artists working in clay, including Greg Crowe, Pippin Drysdale, Sandra Black, Ian Dowling, Graham Hay, Andrew Nicholls, Warrick Palmateer, Bevan Thompson, Andrea Vinkovic and Stephanie Hammill, have been challenged to produce new work, extending their artistic practice by experimenting with both technical and conceptual approaches. Objects and installation-based work will be complimented by innovative audio-visual projection works by Jacob Ogden Smith and Luke Aleksandrow, exploring themes surrounding ceramic practice. 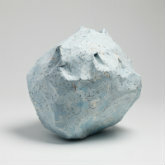 Featured work: Stephanie Hammill, Drift, 2013, porcelain, 7.5 x 17 cm, photography Kevin Gordon, copyright of the artist. In 1792, the Scottish entrepreneur Robert Barker merged the Greek word pan (all) with hórãma (view) when he was searching for a word to describe his 360 by 180 degree painting of the city of Edinburgh. Like all successful inventions, the panorama was of its time and reflected the growing interest in communing with the natural world and travelling to exotic places. The exhibition p a n o r a m a examines the impact of the panoramic format from the early years of the 19th century to current work by contemporary artists and scientists. Featured artwork: Alice Blanch, Box Brownie Colour Panorama #13 (detail), 2012, fine art giclee print, 80 x 280cm. © courtesy of the artist. Visit the p a n o r a m a exhibition website. Transcending Borders gives visual form to the developing cross-cultural relationships between South Korea and Western Australia. The Berndt Museum’s collection of significant historical objects from Korea will be a catalyst for cultural exchanges and collaborations with contemporary artists from South Korea and Western Australia. These artists delve into their own physical and metaphysical terrain to open up real and imagined borders for our contemplation and reflection. The landscape and the natural world have been a long-time preoccupation of artists, but the means by which they are depicted are subject to complex cultural influences. Drawing from the Cruthers Collection of Women’s Art and the UWA Art Collection’s rich store of Australian prints, Worldwide Backyard juxtaposes prints from the early 20th century with works from contemporary Australian artists who have utilised print to analyse the construction of the ‘natural’ world. Featured artwork: Susanna Castleden, Scrunched ball (Pacific Ocean), 2013, Identical paper maps, 45 x 45 x 45 cm, © Courtesy the artist. Visit the Worldwide Backyard exhibition website. Japanese woodblock prints from the Ronald and Catherine Berndt Collection. 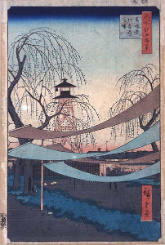 The techniques of Japanese woodblock printing, moku hanga, is identified most closely with the genre of art Ukiyo-e, commonly translated as 'pictures of the floating world'. 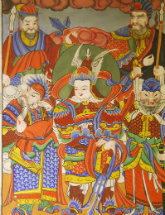 This was adopted from the Chinese book printing techniques during the Edo period (1603 - 1867) and developed into a distinctive art form, using water-based inks to provide a wide range of vivid colours possessing extraordinary transparency. Despite early seventeenth century experiments with the use of movable wooden type to produce books, craftsmen preferred engraved woodblocks for book production of small cheap art prints for a mass market. Now known as Saga books, after the town in which they were created, these classic tales became particularly well known. Ronald and Catherine Berndt collection many such Ukiyo-e together, starting when Ronald was still at school. Drawn not only from the classical sagas of Japan, the Ukiyo-e depicted a contemporary world of people in their landscape and their society. Visit the Ukiyo-e exhibition website to find out more. Shadow Land is a survey exhibition of Anne Ferran’s most significant projects and series, spanning more than 30 years. The earliest series of works touch on French cultural theories of feminism and representation in their staged classical tableaux style. Since 1995, Ferran has been examining and re-discovering Australia’s colonial heritage utilizing museum collections, photographic archives and archaeological sites, nationally and internationally. She is interested in the gaps or silences in the records and personal histories of those incarcerated in prisons, hospitals, mental asylums and female factories. Her practice incorporates a variety of media including photography, textiles, installation, text, and video/film. Visit Anne Ferran: Shadow Land exhibition website. Back to Past Exhibitions archive.